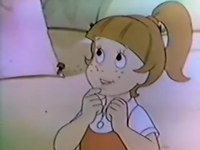 Patty is a character on the Saturday Supercade episode "The Teddy Bear Scare". Patty has freckles and wears her hair in a ponytail. She has a light colored shirt and red overalls. Patty is babysat by Donkey Kong Jr. and Bones at a carnival. She wants a teddy bear from a carnival game, which DK Jr. wins for her. Patty is kidnapped by thieves who hid money inside the bear, but DK Jr. saves her. She receives a new bear and tells her mother what happened while she was gone, although her mother does not believe Patty. Afterwards, Patty wants Bones to babysit her again so she can ride a roller coaster at the carnival. This page was last edited on April 6, 2018, at 06:44.